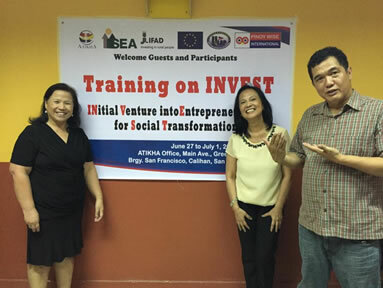 Initial Venture into Social Entrepreneurship for Social Transformation (INVEST) launched – PinoyWISE International Inc.
Atikha and Institute for Social Entrepreneurship in Asia (ISEA) launched the course on social entrepreneurship for overseas Filipinos and their families called INVEST which stands for Initial Venture into Social Entrepreneurship for Social Transformation. The lead faculty of the course are: Dr Lisa Dacanay, president of ISEA and a PhD in Organizational and Management Studies from the Copenhagen Business School in Denmark, Francisco “Jay Bernardo, a successful entrepreneur and guru of entrepreneurship, and Estrella Dizon-Anonuevo, executive director of Atikha and a graduate of Masters in Social Entrepreneurship at the Asian Institute of Management. The initial module of the course was conducted last June 27, 2016 – July 1, 2016. INVEST requires 33 sessions of hands on learning delivered over a period of one year: a 5-day face-to face classroom session; 24 webinar sessions and 4 face- to-face coaching sessions. The coaching sessions are customized per social enterprise enrolled.